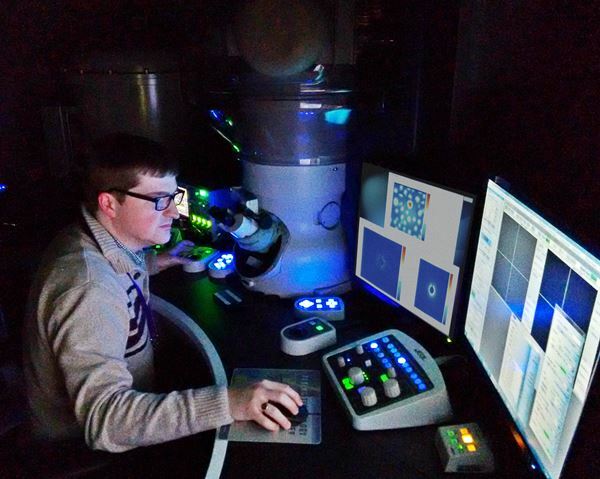 Hi I’m Lewys Jones, an Ussher Assistant Professor of Ultramicroscopy in the School of Physics, Trinity College Dublin. I lead the Ultramicroscopy research group, focussed on instrument and technique development for high-performance electron microscopy. My current research in metrology development is based around exploring the design and function of the aberration-corrected scanning transmission electron microscope (STEM), to improve the analysis of atomic-resolution annular dark-field (ADF) data and EELS and EDX chemical mapping. Themes include ADF normalisation by detector efficiency, correction of scan-noise and scan-distortion and correction of artefacts in EELS spectra. As part of this research, a series of image analysis and processing codes have been written to inspect, improve and quantify atomic-resolution ADF STEM data. Interesting applications of quantitative image analysis include three-dimensional nano-metrology, aberration measurement, beam-damage analysis, and high-resolution strain measurement. After a first degree in Material Science, I received my PhD from the Department of Materials at the University of Oxford in 2013. This focussed on two themes; scanning stability in the aberration-corrected scanning transmission electron microscope (AC-STEM) and also on applications of focal series of annular dark-field data. In 2014 a software plug-in for Digital Micrograph to correct scan-noise (the Jitterbug software) was launched in collaboration with HREM Research. More recently in 2016, another plug-in to bring fast non-rigid registration to DM was launched (SmartAlign). I am a co-director of the SFI-EPSRC Centre for Doctoral Training in Advanced Characterisation, I am an Associate Editor of the journal Advanced Structural and Chemical Imaging, and have been a Fellow of the Royal Microscopical Society since 2015.